The 2010 Arizona Diamondbacks struck out 1,529 times, or 154 more than any other team. They were tied for 20th in the majors in batting average (.250) and ranked seventh in the National League in on-base percentage (.325) and eighth in runs (713). Pitching-wise, Arizona was even worse. Diamondbacks pitchers compiled a 4.81 ERA, good enough for 28th in baseball. They allowed 210 home runs, the most of any pitching staff and 24 more than the 29th-place Orioles. Arizona was 27th in runs allowed (836) and 26th in hits allowed (1503) while they finished 11th in the NL in walks issued (548) and 14th in strikeouts (1070). The Diamondbacks had 12 different pitchers, all of who accumulated a 4.39 ERA, which was 23rd among major league starting rotations, make a start. The inconsistency in the starting rotation led to an overworked bullpen that was already short on talent. Arizona had a major league-worst 5.74 bullpen ERA, a full run worse than Cubs’ bullpen, which finished 29th with a 4.72 clip. What all of the Diamondbacks’ inabilities added up to was a 65-97 finish, a full 27 games behind the NL West and eventual World Series champion San Francisco Giants. The 2011 season did not begin with much hope for improvement. After an 8-4 loss to the San Diego Padres on May 16, Arizona found themselves in last place of the West with a record of 17-23. However, from there, the Diamondbacks began their ascent towards the top of the division. Arizona won six straight games to vault themselves into third place, lost once and then won seven in a row to jump into first place. They have not been lower than second place since May 24, and with their current season-long nine game winning streak, have built a six game lead over the Giants in the division. How in the world did Arizona, which had a .406 winning percentage from the beginning of the 2010 season through May 16 and hasn’t had a winning season since 2008, turn their season around to take control of the West and become the story of the season? Since May 16, the Diamondbacks are 61-36 (.629 winning percentage). The improvement of Arizona’s pitching is the main reason why they have been on such a role. 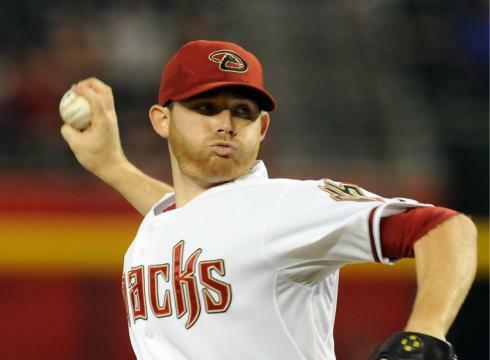 Ian Kennedy, once a talented prospect with the New York Yankees who compiled a 6.03 ERA in only 12 starts with New York over three years, was given a chance by the Diamondbacks to work through his growing pains and learn how to become an effective major league pitcher. Kennedy has responded by leading the NL with 17 wins compared to just four losses. He has a 3.03 ERA, 1.121 WHIP and is striking out 3.29 batters for every walks (7.7 K/9 ratio) in 187.1 innings over 28 starts. Behind Kennedy in the rotation is another young and talented pitcher named Daniel Hudson, who the Diamondbacks acquired as the centerpiece of the Edwin Jackson trade with the White Sox near last year’s Trade Deadline. Hudson has excelled with the chance Arizona gave him, going 14-9 with a 3.61 ERA, 1.241 WHIP and a 3.60 K/BB ratio (6.9 K/9) in 187 innings over 28 starts this season. Thirty year-old lefty Joe Saunders (27 starts, 9-11, 3.82 ERA, 1.326 WHIP, 1.54 K/BB ratio in 172 IP) has been the consistent veteran presence in the rotation while rookie Josh Collmenter (20 starts, 9-8, 3.18 ERA, 1.046 WHIP, 3.67 K/BB ratio in 130 innings) has helped fill out the back of the rotation despite a fastball that averages just 87.4 miles per hour. Arizona has gotten inconsistency from its fifth starters this year, but should they reach the postseason, those four pitchers should give them a formidable rotation for the playoffs. The Diamondbacks’ bullpen has also played a major role in Arizona’s rise to the top of the West. Three pitchers who were not on the team have helped both manager Kirk Gibson feel comfortable calling for relievers and lower the bullpen ERA from 5.74 a year ago to 3.61 (16th in MLB) this year. The trade of third baseman Mark Reynolds to the Orioles brought back David Hernandez, who has been the Diamondback’s top setup man, going 3-2 with a 2.72 ERA, 1.106 WHIP and 2.28 K/BB ratio (10.0 K/9) in 59.2 innings over 64 appearances. Joe Paterson, who Arizona selected from San Francisco in the Rule 5 Draft, has given Gibson a reliable lefty in the bullpen, going 0-3 with a 2.59 ERA, 1.181 WHIP and 2.17 K/BB ratio (7.5 K/9) in 31.1 innings over 55 games. The final piece of the puzzle to the bullpen’s improvement is J.J. Putz, who the Diamondbacks signed to be their closer this offseason. Putz had only five saves over the past two seasons, but is 2-2 with a 2.61 ERA, 0.952 WHIP, 35 saves and a 4.18 K/BB ratio (8.6 K/9) this year, shutting down opponents in the ninth inning. While Arizona’s bullpen still ranks in the middle of the pack in baseball, it has improved enough, along with its starting pitching and offense, to be a serious contender to go to the postseason. The Diamondbacks’ offense, which was right about average in terms of scoring runs last year, certainly wasn’t the biggest reason why Arizona suffered through a miserable 2010 season. 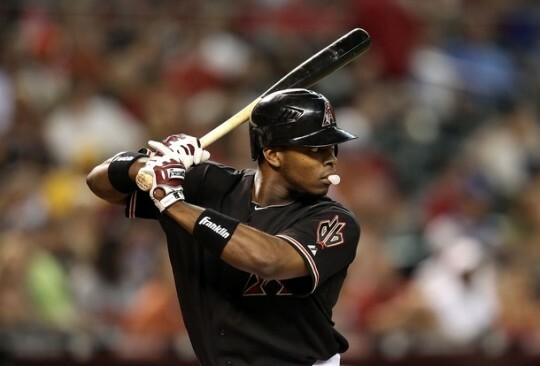 However, in 2011, the Diamondbacks’ most talented players, their outfielders, have stepped up after a disappointing 2010. Twenty-four year old right fielder Justin Upton has cemented himself as a Most Valuable Player candidate, batting .294/.373/.536 with five triples, 26 home runs, 80 runs batted in, 20 stolen bases and an NL-leading 36 doubles. Twenty-four year old left fielder Gerardo Parra is hitting .294/.355/.432 with 15 doubles, seven triples, seven homers and 34 RBIs and 27-year old center fielder Chris Young has posted a .232/.320/.418 batting line to go along with his 29 doubles, 19 home runs, 63 RBIs and 19 steals. The infield and catcher positions have given Arizona just enough offensively to complement its productive outfield, highlighted by catcher Miguel Montero (.276/.346/.458, 31 doubles, 14 homers, 72 RBIs) and third baseman Ryan Roberts (.257/.353/.438, 21 doubles, 17 home runs, 52 RBIs, 16 stolen bases). The Diamondbacks still strike out a ton offensively (1,066 punchouts – 4th-most in the NL), but they have improved on making contact at the plate, been optimistic and aggressive on the basepaths (109 steals – third in the NL) and have hit the ball very hard, as they currently rank sixth in the NL in doubles (239), fourth in triples (31) and third in both home runs (150) and slugging percentage (.413). Similar to their pitching, Arizona isn’t an elite offensive team, but have cut down on their mistakes at the dish just enough to compete in the NL West. By playing .629 ball since a 17-23 start left them in the basement, the Arizona Diamondbacks find themselves as baseball’s surprise team, six games ahead of the defending World Series champion San Francisco Giants in the NL West. The question is, will the Diamondbacks be able to hold onto their lead with 25 games to play? Arizona is not an elite offensive or pitching team. They have improved just enough to overtake a slumping Giants team that has baseball’s worst offense. The Giants, who also happen to own the majors’ best pitching staff and only play NL West teams in their remaining 25 games, are 29-18 (.617) against the division, including 8-4 against the Diamondbacks. The two teams’ begin a three-game series in San Francisco tomorrow before playing three more games in Arizona from September 23 through September 25. The Diamondbacks are 30-23 (.566) against their remaining competition, which includes all four of their NL West rivals and three games with the Pittsburgh Pirates. The Arizona Diamondbacks have been the story of the baseball season up to this point. They will need to beat the Giants and stay hot over the final month of the season for their magical ride to continue into the postseason this October.